Calls answered by live person 24 hours. Precision Overhead Garage Door has always been dedicated to bringing you REAL, fair and honest reviews. 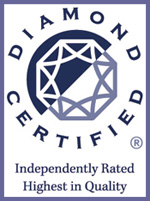 We receive reviews from our customers through many different mediums. To make our reviews more transparent, we have decided to reveal how exactly these reviews get here. This review was a "Report Card Submission". 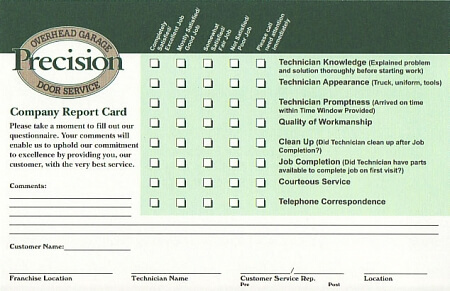 We ask our customers to fill out a "report card", like the one pictured below, at the completion of every job. The star rating is an average of how the technician performed in knowledge, promptness, courtesy, ability to finish the job quickly and in one visit, clean up of the job site and overall quality of the finished work. To add transparency to our business we make these public on our website. This review was an "Online Submission". At the completion of every job we ask our customers to review our business on our website. Their comments are reviewed manually for inappropriate language and then posted to the website unedited. "Aramis arrived right on time for my scheduled appointment. He was very knowledgeable and did high quality work in repairing my garage door. 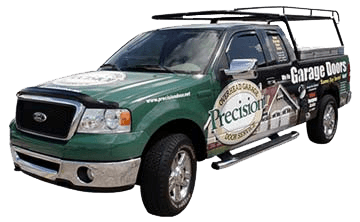 Highly recommend Precision Door Service." "Cory did a great job explaining to me what issues I needed to address without pressure. The job included fixing / tuning three openers. Job well done. I am very satisfied." "Our garage door was making a loud noise when opening and closing. After hector worked him magic, our garage door is like new again!" "Fantastic service! Mike was a pleasure to do business with. He was able to get my springs replaced and get my garage door working like it used to 10 years ago! Thank you for sending great techs. We would highly recommend Precision Door Services to our friends and family." "Aramis called me 15 minutes before my appointment! Showed up on time, gave me a quick estimate. Completed the work in a professional manner. Im completely satisfied. Glad We went with Precision Door Services! We would highly recommend them to our friends and family!" "I was very pleased with the job done for me yesterday. Arrived on time, explained everything and my options. Did exactly what I wanted. Timely and cleaned up as well. Paulino was the guy who did the job and I would request his work to anyone. Thank you!!" "We bought a REALLY quiet garage door motor and it was installed very quickly. Highly recommend." "If you need a garage door motor call Precision and ask for James. Jaes installed a PDS800 motor that is really quiet. Great work." "My garage door would not close so I called Precision from an ad on Yellow pages. My technician arrived at about 7pm and fixed my door in no time at all. He took the time to explain to me how everything works so it would not happen again." "Our garage door motor broke. We called Precision and it turns out it was our spring not our motor. The repair was completed and our door works fine. Brandon did a good job." "Mike arrived on time and ready to work and was very knowledgable when repairing my garage door. Thanks!" "Malek was right on time and did quality work on my garage door and opener. Thank you." "Excellent knowledge and courteous service on my garage door and opener." "Service - repair garage door repair. My technician was wonderful! He saw what the problem was and fixed it quickly. He was efficient, fast, friendly and respectful. I could not of asked for better service. Thank you for having such wonderful technicians." "New Springs, rollers made my door real quiet"
"Very good service. 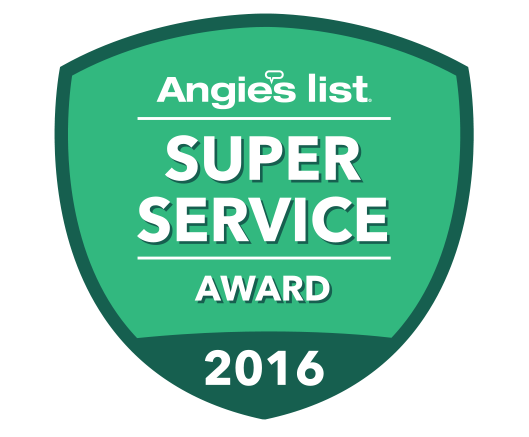 Garage door technician was knowlegable and courteous."